Stay in the loop by signing up for our monthly newsletter! Or not. I mean, you do you :) But we my have free tickets from time to time, so it can't hurt, right? "YOU WANTED THE BEST - YOU GOT IT! ROCK IT MAN ENTERTAINMENT!" "We had Jon Li and Rock It Man Entertainment perform for our wedding in October 2015, and it was awesome! Both my bride and I decided that we wanted something more fun and interactive as opposed to the typical DJ / dance thing, and Rock It Man Entertainment delivered it in ACES!! Jon did a great job in keeping the music rolling and the wedding reception guests singing and dancing! Since the wedding all the wedding guests have said the same thing “Wow – what an incredible reception with the dueling pianos! !” It was truly fun!! This was by far the most fun I’ve had at a wedding (of course I’m a bit biased as it was my wedding) but if you’re looking for an absolute ROCK STAR wedding reception – you got it right here! You wanted the best–you got it: Rock It Man Entertainment!" • DUELING PIANO SHOW PACKAGES - Our most popular show. Two of our skilled entertainers with two pianos and two microphones taking all your song requests and delivering a highly interactive show catered specifically to you and your guests. We are proud to offer one of the best dueling pianos experiences you will find at a price that's hard to beat! • SOLO PIANO SHOW PACKAGES - Our most intimate Rock It Man experience at our most cost-effective price! One talented entertainer. One piano. One voice. With the same level of audience interaction, customizability and positive energy that you get with our dueling pianos, our solo piano shows also very popular, especially for more intimate parties. • FULL BAND SHOW PACKAGES - Looking to add In addition to pianos, we produce shows with many other instruments, including live drums, bass, guitar, and even saxophone and fiddle! In fact, almost all of our talented musicians play at least two or three different instruments. Customize your Rock It Man experience with any arrangement that best fits your needs for your event. • COMPLIMENTARY DJ & MC SERVICES - While the main services we offer are live music and entertainment, if there are portions of your event that require a DJ or MC, we've got you covered! You can take advantage of our complimentary DJ & MC Services, which are included in most of our Wedding and Event Packages at no additional cost to you and are perfect for wedding receptions. All of our packages also include full access to our premium sound and lighting equipment, as well as wireless microphones. • LIVE KARAOKE - Nothing else gets people involved at a party or event like karaoke does (well, maybe nothing but alcohol)... and what's even better than karaoke? Live Karaoke! Forget the karaoke machine. When you book Rock It Man, you have your very own personal live backup band to accompany you and your guests on your favorite Journey or Garth Brooks song! Our entertainers have extremely diverse repertoires consisting of thousands of popular songs from the past six decades of popular music–as well as all the biggest current hit songs. From classic rock to current pop, country to rap, smooth jazz to heavy metal, Disney to Motown—we’ve got something for everybody. Simply request your jam, grab the mic & lyrics (which we provide), and get ready to unleash your inner diva / rock star! • WEDDING CEREMONY MUSIC - Every wedding ceremony needs music. Instead of looking elsewhere to hire a DJ or live music for your ceremony, why not save your valuable time and energy by having our world-class musicians provide your ceremony music? We can provide live and recorded music for your wedding ceremony, which includes: prelude, processional, bridal processional, recessional, and postlude. If you choose Live Ceremony Music, prior to your wedding day our musician(s) will learn up to 3 new songs or musical selections of your choice. • COCKTAIL HOUR & DINNER MUSIC - In addition to your ceremony and the dance portion of your reception, we can provide live and recorded music for your cocktail hour, as well as dinner. Feel free to provide us with a playlist or list of song requests that you would like us to play during your cocktail hour and/or dinner. Cocktail Hour and Dinner Music may be instrumental or include vocals, depending on your preferences. All of this makes Rock It Man Entertainment your one-stop solution for all your music and entertainment needs! Congrats–you're getting married! We know how much time and effort goes into planning every last detail, from the centerpieces to the dinner menu. One of the biggest decisions that every couple has to make is what they want for their music and entertainment, which sets the entire tone throughout your wedding and reception and will be remembered by not only your family but all of your guests. Having unique and outstanding entertainment will not only be memorable for everyone who attends your celebration, but will also help you get the most out of your photography and videography that captures those unforgettable moments. We realize that most couples book either a DJ or traditional wedding band for their reception. When you book a show with Rock It Man Entertainment, you get the best of both worlds–plus a touch of family-friendly improv comedy–in our unique and highly-customizable piano shows. Our shows have the unique advantage of feeling more intimate than any DJ while also offering much more variety and customizability than any band. All of our talented entertainers are highly trained musicians who are also experts at making you and your guests feel comfortable being a part of our show. From singalong anthems to dance-offs, comedic bits to conga lines, get ready for an unforgettable experience that will have your wedding guests raving for months! We are proud to be an exclusive live music partner of The Wedding Guys (who showcase our Dueling Pianos at their award-winning Unveiled Wedding Events and Twin Cities Bridal Shows), as well as the sole live music vendor providing live music and entertainment for regular events hosted by the Twin Cities Wedding & Event Professionals (TCWEP), the Forever Bride Association, the Twin Cities Wedding Association (publishers of Perfect Wedding Guide), and Visit Saint Paul / I Do Saint Paul. 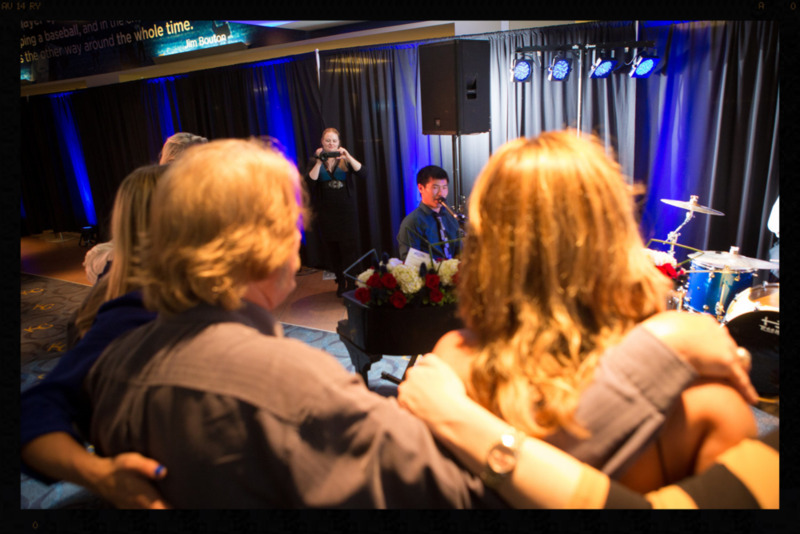 If you've ever been to a Twin Cities Bridal Show, Unveiled Wedding Event, or Wedding Fair, then chances are you've seen our Dueling Pianos featured at these awesome events! Planning a fundraiser? We have helped many organizations raise thousands of dollars at fundraisers for a variety of great causes and charities. At every Rock It Man fundraiser, we encourage our audience members to support your cause or organization while honoring their generous donations by performing their song requests. When you book us for your fundraiser, we can help you RAISE A LOT OF MONEY for your cause WHILE making your event A BLAST FOR EVERYONE! "We had high expectations when we booked Rock It Man Entertainment for our company party and their performers and staff exceeded each and every one of them. Jon and Becca had everyone at our party singing everything at the top of their lungs–from Journey to Johnny Cash. We've had live music at our annual holiday parties for the past twelve years and I've never seen the dance floor so packed! My favorite part of their show is how they get so many members of the audience involved, even all of our branch managers. I can't remember the last time I had this much fun and we can't wait for our next opportunity to book Rock It Man!" Rocking dueling pianos for a fundraiser in Kansas City, MO. We have helped many organizations raise thousands of dollars at fundraisers for a variety of great causes and charities! When you book us for your fundraiser, we can help you RAISE A LOT OF MONEY for your cause WHILE making your event A BLAST FOR EVERYONE! Any of our past clients would gladly share their unforgettable experiences they had with Rock It Man Entertainment. More than half of the shows we have booked in the past year are either repeat clients or word-of-mouth referrals from past shows. If you would like to speak with any of our past clients, simply ASK US and we will gladly provide contact information to help you get in touch with them! 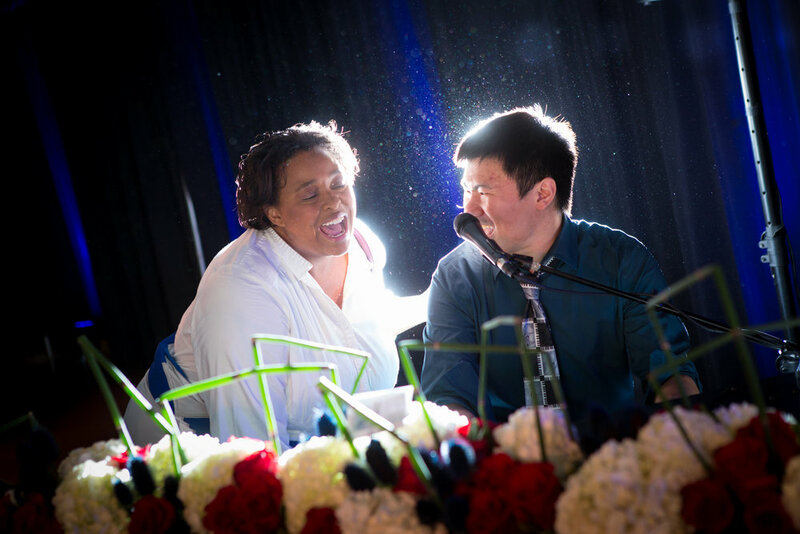 “We had Jon Li and Rock It Man Entertainment perform for our wedding in October 2015, and it was awesome! Both my bride and I decided that we wanted something more fun and interactive as opposed to the typical DJ / dance thing, and Rock It Man Entertainment delivered it in ACES!! Jon did a great job in keeping the music rolling and the wedding reception guests singing and dancing! Since the wedding all the wedding guests have said the same thing “Wow – what an incredible reception with the dueling pianos! !” It was truly fun!! “We were pleased with our choice to hire Jon Li and Rock It Man Entertainment for our World Series Gala in October 2014. We wanted Dueling Pianos entertainment from the very beginning, but struggled to find the right person that would fit our budget and corporate regulations. Jon was very professional and flexible enough to handle our strange requests and requirements with ease. Jon and Hannah came prepared at their designated load-in time, set up and performed a superb show with little day-of guidance or supervision. "THE PERFECT ADDITION TO THE EVENING"
“We hired Rock It Man Entertainment to support our annual National Night Out event for the residents of a rental townhome community. Jon did an amazing job by keeping the energy up all evening. Typically at events like these in the past, our attendees would only stay for 30 minutes or so. With his help, most of the attendees stayed the whole two hours! Jon incorporated a mix of music to make sure all age groups had something they could sing along to. "LAUGHS AND FUN ALL NIGHT"
"Wish We Could Do it All Again!" Rock It Man Entertainment helped make my husband’s 50th birthday party a huge success! Robert and Rock It Man Entertainment were the perfect choice for our party! Before the party, he offered some great suggestions to help the flow of the evening and prepared some songs that were special to my husband. During the party, he set the festive tone right from the start and progressed the music perfectly as the night evolved. There was something for everyone on our multi-generational-guest list to enjoy. And he honored special guest requests, too! I have received so many complements from our guests about how great the musician was and how fun the party was. They were even trying to coax me to keep him playing and pay the city noise-fine after hours! I will definitely use your group again and recommend Robert or another of your talented musicians for any party or event! Cheers! "THANK YOU FOR MAKING EVERYTHING MORE FUN!" "THEY KEPT EVERYONE INVOLVED FROM START TO FINISH"
ROCK IT MAN ENTERTAINMENT is proud to work with some of the best all-around live entertainers and musicians in the entire industry. We have performed hundreds of shows across the US in over thirty states, Canada, and even Singapore and Taiwan. Meet the faces of some of the men and women of Rock It Man Entertainment who ROCK IT each and every time they get up in front of an audience. Our entertainers are based in different parts of the country and are available for travel nationwide. Go.... go, Jonny, go... Jonny be good! JON LI (Saint Paul, MN) is a musician of many talents who hails from the Twin Cities and is known for his ability to create and deliver music that connects with a wide variety of audiences and stays with them long after he leaves the stage. An accomplished classical pianist and seasoned multi-instrumentalist, Jon has been a natural performer since grade school. Growing up and during his teen years, when Jon’s energy wasn’t focused on winning piano competitions, he broadened his musical palette by leading worship at his church and teaching himself other instruments, including the guitar, bass, cello, and drums. Now 28, the young artist has performed on stages in well-established venues across the globe from L.A. to Taipei. Jon rocking his beloved American-made Fender Stratocaster... in the snow-covered streets of his native Minnesota landscape! Photography by Mike Bullard. CHRIS (Minneapolis, MN) is one of the most versatile and creative performing artists / songwriters around. Hailing from Minneapolis, Chris has been an active staple of the local music scene for more than a decade. As a founding member of the cover band The Big Strong Men, Chris has performed classic covers from the 70s to today at venues throughout the Twin Cities and beyond. In 2014, Chris and his wife Jennie began writing, recording and performing original pop music the band name Warehouse Eyes. Playing dozens of shows from small venues to large festival stages, they quickly built a following that continues to grow to this day. CORY (Los Angeles, CA / Minneapolis, MN) sang and trained as a pianist since the fourth grade and is now a highly sought after performance and studio musician in the Twin Cities area. He studied music, theatre and dance at the University of Minnesota-Duluth where he aided a handful of productions, including Guys and Dolls and Sweet Charity as Musical Director. CASSONDRA (Minneapolis, MN) is one of the hottest musicians on the Twin Cities music scene. Her spunky personality, quick wit, and undeniable talent make her nearly impossible not to fall in love with whenever she performs! JACY (Minneapolis, MN) – a Minneapolis born-and-raised performer and songwriter – has been involved with many acclaimed musical acts and organizations throughout the Twin Cities and abroad over the past 9 years, including a stint as the lead vocalist on Carnival Cruise Lines. To the Devil: Hannah "Fiddle" Dowell will take your bet and you're gonna regret 'cause she's the BEST there's ever been! Photo by Melissa & Beth. HANNAH (Kansas City, MO) hails from Amarillo, Texas, where she studied Suzuki violin from the age of 4 and was an active member of the Amarillo Opera Company from the age of 5 until she graduated high school. Hannah moved to Kansas city in 2000 to study violin performance at UMKC Conservatory of Music. JASON (Springfield, MO) is one of the hottest up-and-coming singing piano entertainers in the Midwest. He started performing in dueling piano bars and local venues around the Ozarks for the past several years. Since then, his endeavors have expanded to take Jason all over the country. As of the summer of 2015, we are proud to have him as one of the newest entertainers on our amazing team at Rock It Man Entertainment. KATY (Chicago, IL) is a world-class entertainer and musician based out of Chicago. As a dueling and solo piano player, she has performed throughout the US, Germany, and at Sea. She also works as a Music Director for sketch and improv comedy. Previous credits include Music Director for Second City’s National Touring Company and at sea onboard the Norwegian Spirit. TROY (Chicago, IL) is unquestionably one of the most dynamic performers and experienced entertainers that Rock It Man Entertainment has to offer. Over the past few decades, Troy has created a distinct and energetic, fun-filled, thrilling, interactive musical sensation! He uses his unparalleled musical talent and comedy to capture the best elements of the wildly popular dueling pianos entertainment concept. DAINA (Minneapolis, MN) is a piano entertainer and Twin Cities musician with a long history of successes and many thousands of satisfied audiences. She is a dedicated entertainer providing a wide range of skills and experiences to her guests and audiences. Among her many talents are dueling piano player, cabaret performer, band leader and award-winning singer and songwriter. She’s also gained recognition for her talents as a playwright, musical director and arranger, an artist, writer, and recording artist. De Prez has a long history of providing exceptional service and beautiful artistry. She is a natural born entertainer and, at heart a renaissance woman who has dedicated her life to perfecting her craft. It’s easy to see just how much she loves what she does. For the last 30 years, De Prez has called Minneapolis, Minnesota her home. In Minneapolis, she was one of the house entertainers at Nye’s Polonaise Room from the piano bench. Throughout her nearly 40 year career, De Prez has received raving results from an expansive number of successful events spanning the globe as far as Norway, the Caribbean Islands of Barbados, Virgin Gora, St. Maarten and Aruba, and Amsterdam. Though talented in a multitude of arts and styles of music, Daina De Prez has a love for The Blues. He repertoire, though, is impressive including every type of music from the 1960s, 70s, 80s, 90s, and today. Her love of music and skill expands nearly a century of styles from classic to the most modern. This allows De Prez to tailor her experience to fit virtually any audience, theme, or venue ideally. A diverse and dedicated professional, Daina has long had a passion for performing and providing exceptional quality experiences for each guest that attends her events. A “Daina Show” provides those in attendance with the ability to not just watch the events but also to become a part of the show. This stems from her early love and ability to command the stage at any event. She is quite aware of the room and capable of capturing attention quickly and maintaining it. Additionally, her wry wit and impressive improvisation has allowed her to enhance and fascinate audiences throughout the world. Dedicated to learning and growing, De Prez is also one to spend her time enhancing her skills and growing her talents even further. You will find her experiencing the latest tunes or diving into older, traditional pieces to further explore her opportunities and her skills. MARK (Saint Paul, MN) has been performing and doing studio work in the Twin Cities and parts north for the past 30 years as a solo artist and with numerous bands including The Mraz Brothers Band, The Mill City Players, Mother’s Hot Dish, Raggs, and is also a frequent first-call substitute for local bar bands. GREG (Minneapolis, MN) is one of the the Twin Cities' most experienced piano bar entertainers. As a key member of their original lineup, he helped open up Minnesota's first dueling piano bar–Little Ditty's–in the Mall of America, and has rocked audiences in thousands of dueling piano and solo piano shows over the past two decades. During his more recent ventures, Greg has traveled the globe as one of the most sought-after piano bar entertainers for international cruise lines. These experiences, coupled with his incredible musicianship and personality, enable him to cater to international audiences. Greg is a true master when it comes to crowd interaction and audience participation, as well as impersonating music legends such as Elvis Presley and Sir Elton John. With a vast repertoire spanning everything from high-energy rock & roll to standards, Greg Sampson brings the party with every song he delivers! JORDAN (Kansas City, MO) spent much of the early years of his life in Topeka, KS realizing and cultivating his passion for music. After high school, Jordan moved to Lawrence KS and started attending the University of Kansas, where he studied Health, Sport, and Exercise Science. It is during his time at KU where he was introduced to dueling pianos for the first time. One night, after paying the $20 stage fee, Jordan played the drums on a few songs and made such an impression that he was offered a job as the house drummer for the bar that very night. "WE WILL, WE WILL... ROCK YOU!" So maybe you "Can't Help Falling In Love" with your favorite anthems like "Don't Stop Believing", "Bohemian Rhapsody", or "Friends In Low Places". Maybe you're "Feeling Good" and "Can't Stop the Feeling" that makes you want to "Jump", "Shout", "Raise Your Glass" and "Shake Your... Tailfeather" ;) ... or maybe you wish that everyone around you would just "Shut Up and Dance". Perhaps you'd "Rather Be" "Taking It Easy" and "Sitting On the Dock of the Bay" outside the "Hotel California" while watching "Scenes From An Italian Restaurant". Whatever you "Fancy", it's really "All the Small Things" that matter, and whether you're from "Sweet Home Chicago" or "Sweet Home Alabama", "I Gotta Feeling" that "We Will Rock You" like a "Wagon Wheel" and you'll "Lose Yourself" in the "Music of the Night" whenever we "Rock & Roll" "All Night Long". Whether you want to "Sing" all the high notes to "Uptown Girl", get "On the Floor" with your "Brown-Eyed Girl" for just "One Dance", or "Watch Me" show off "All the Right Moves" to the "Cupid Shuffle", we guarantee that we've got "Something" to make you "Happy" you booked one of our shows! So if you're feeling "Stressed Out", "Get Ready" to "Shake It Off", "Let It Go", and "Get Ready" to "Rock Around the Clock" and "Celebrate Good Times" with us - because we "Promise" there ain't no party like a Rock It Man party! For those of you who have already seen us "Rock It Man", we sincerely hope that "It Won't Be Long" until we "See You Again"... and if you haven't already, stop by Facebook and say "Hello". All of our shows are request-driven, which means that YOU get to choose the songs (from any genre or era) that you want us to play throughout your event! Request everyone's favorite anthem or play "try to stump the piano players". From start to finish, we will be your interactive human jukeboxes for your singing and dancing pleasure. One thing that sets us apart from many Dueling Piano shows is that, in addition to all of the classic hit songs from the 50s, 60s, 70s, 80s, 90s, and 2000s, we always stay up to date with the most current Top 40 hits. From classic rock to current pop, country to rap, alternative to R&B, heavy metal to light jazz, Disney to showtunes, bluegrass to EDM, hymns to contemporary Christian, TV themes to Christmas carols, folk to classical – WE KNOW IT ALL! That means that no matter the age or musical tastes of your guests, we can cater our show to any audience and put on the best musical variety show possible to make your event memorable for all. Above is an example of a completed request form. Our easy-to-use request forms are handed out before the start of every show. Not sure what songs to request at our next show? Just to give you an idea, here is just a sample of some popular song requests that we perform regularly at our shows!